The yellow blazed trails at Little River both follow nice, narrow dirt paths through the pine forest with only a slight bit of dirt road peddling. 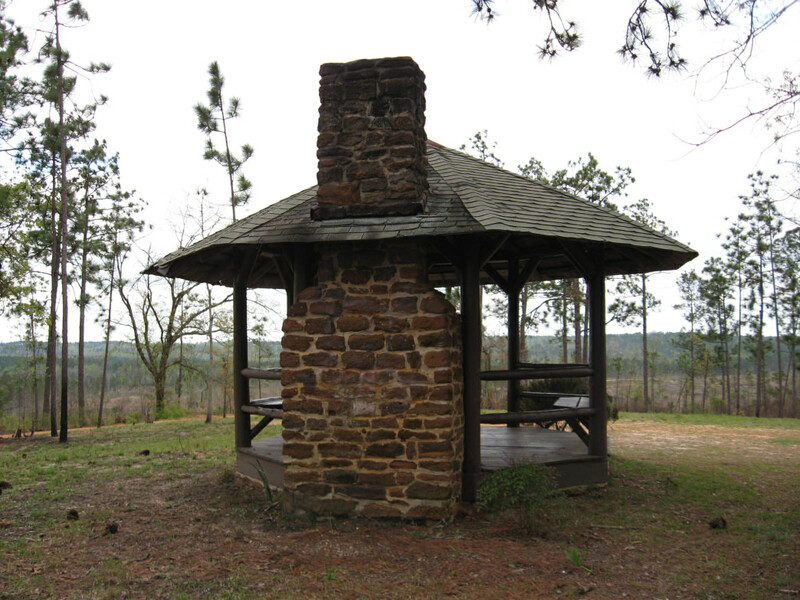 A gazebo built by the CCC in 1935 still stands at the turn-around on the Gazebo Trail. A bridge over this stream was destroyed by a hurricane. Be careful crossing it now. A local group of volunteers is working to rebuild the bridge and it may be under construction during your visit. A little hideaway just north of Atmore, Alabama, Little River State Forest offers cyclists in L.A. (Lower Alabama) a chance to pedal on a trail with a little elevation (a couple hundred feet). There are plenty of swales and hills and valleys to climb making the trails here challenging. And the scenery isn’t so bad, either. There are a few hill climbs. About 1 hour on each trail. Little River State Forest offers cyclists a bike a trail with a little elevation change through a beautiful pine forest. This little gem is hidden away just north of Atmore, Alabama, and has two main trails totaling 5-miles in length that feature hills and valleys to climb and a couple of swales and streams to navigate as you pedal through a pine forest with blooming white dogwoods dotting the landscape and an historical structure to visit, a gazebo built by the C.C.C. in 1935. Only a short hour or so away from Alabama’s Gulf Coast beaches you’ll find Little River State Forest (LRSF). 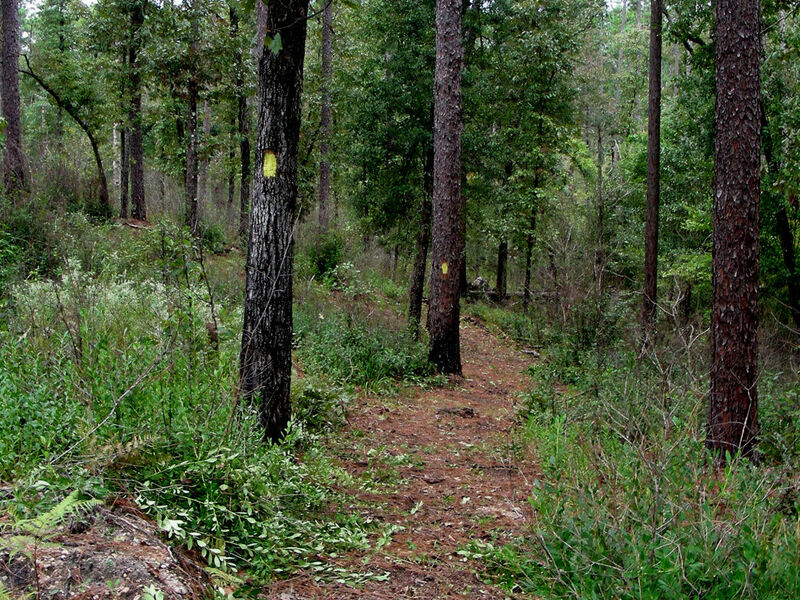 This hidden gem just north of Atmore is a great spot for picnicking, swimming in the lake, hiking, and most people don’t realize – mountain biking. What makes a ride at LRSF great is that you finally get into some elevation, albeit 200 to 300 feet above sea level, but that’s just enough to give you plenty of hills, valleys, and ravines to glide up-and-down and several swales and creeks to navigate. The park has two main trails that cyclists will share with hikers – the 2 mile Bell / CCC Loop Trail and the 4-mile Gazebo Trail out-and-back. Plus there are several miles of wide dirt roads you can ride as well. Both trails begin at the old bath house next to the lake. The Bell / CCC Loop crosses the lake’s spillway over a scenic bridge, then travels through the woods on a narrow path before using an old dirt service road to make a rather steep uphill climb to its intersection with the CCC Trail which is the original road used by the Corps when building the park. The Gazebo Trail is the more scenic of the two trails, winding its way through the pine forest with numerous little hills to navigate, a couple of swales, and a feeder stream to the lake finally arriving at a gazebo that was built by the CCC in 1935. This is a great family friendly park so that when you’re not peddling the trails you can picnic under the pines while the kids swim in the icy cold waters of the lake, dive in from the zip line, or play in the playground. 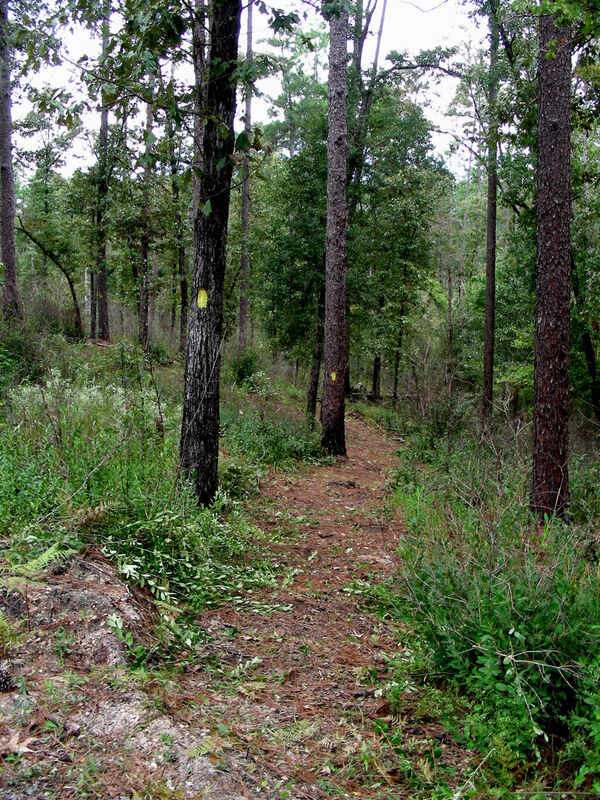 Beginners through advanced riders will enjoy the trails here as they give you your first real elevation along the state’s Gulf coast, around 200 to 300 feet above sea level. The narrow to medium wide paths have just enough challenge over roots, rocks, and boggy areas to make it interesting and the dirt service roads give you a chance to build up some real speed as you head down the hillsides. From Atmore at the intersection of I-65 at exit 57 and AL 21 take AL21 north 11-miles. Turn right into the park on H-Kyle Road. Travel 0.4-miles to the pay station. After paying your fee continue straight 0.1-miles and park in the large parking lot next to the lake and old bath house. 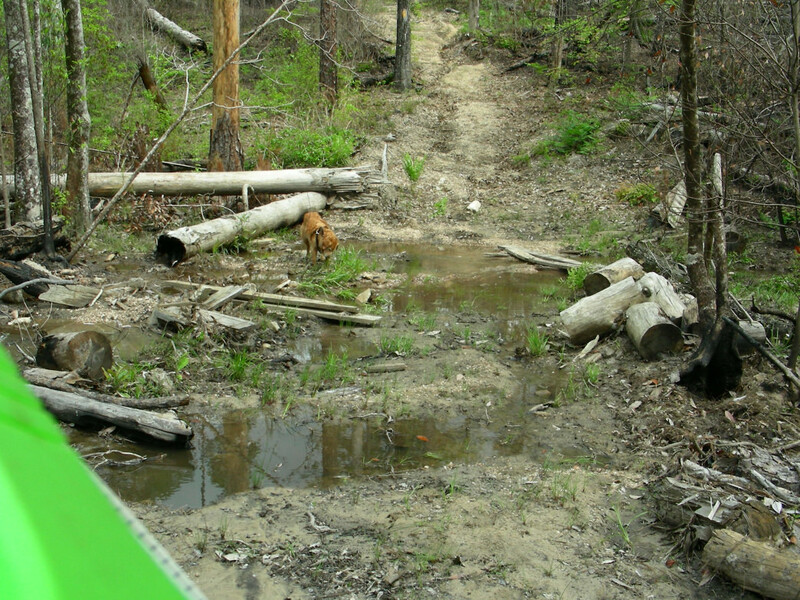 This is the trailhead for both trails. Begin the Bell / CCC Loop by heading west following the banks of the lake to the spillway and cross the dam here. The Gazebo Trail begins to the northeast side of the parking lot. Both trails are blazed with yellow paint blazes. The park is open from 9 a.m. to sunset. Call ahead before heading out on a major holiday (Thanksgiving, Christmas Eve and Day, and New Year’s Day) to verify they will be open.